Happy week 2 of Halloween season, everyone! As mentioned in my post last week on group costume ideas, this month I will be providing weekly inspiration for quick and easy Halloween costumes that you can put together using items you already have in your closet. Last week we covered group costume ideas, but keep reading if you’d like your costume to scream “#bestfriendgoals” a little more than “#squadgoals”. Here are some of my favorite pairs of TV best friends whose looks would be easy to steal for killer duo costumes for you and your BFF! 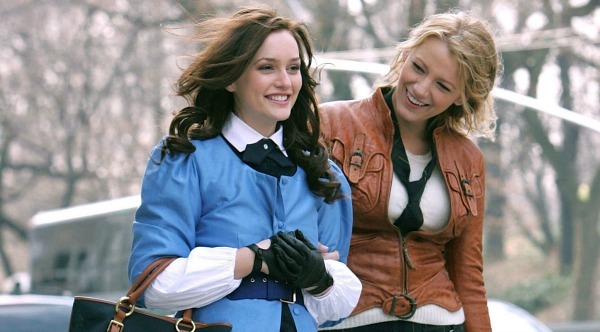 Was there ever a more iconic best friend duo on television than Blair and Serena? I had plans to rock this costume with own my best friend… but then we found out that the party we’re attending is “mad scientist”-themed. (Whoops!). 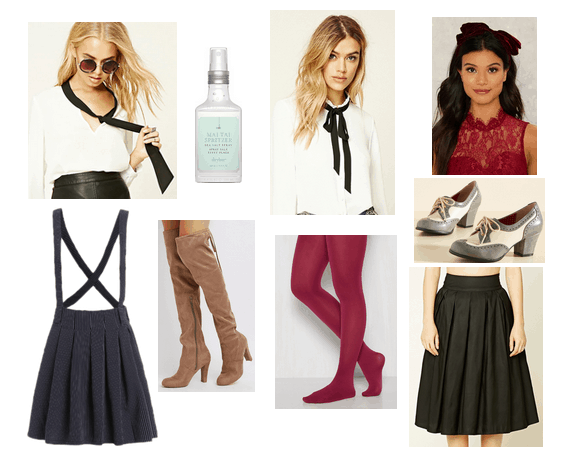 So let me live vicariously through you by helping you create this “private school with a twist” Blair and Serena Gossip Girl costume. At the beginning of the series, Blair and Serena both attend Constance Billard School for Girls, a wealthy prep school that apparently has a pretty lax dress code, as it seems anything is acceptable as long as a white blouse and black skirt are in there somewhere. Serena van der Woodsen‘s style is very bohemian and edgy, so use a white blouse with a casually undone tie and a black skirt with jaunty suspenders as a base, then accessorize with knee-high suede boots and run some sea salt spray through your tresses to get her enviably beachy waves. For a set of best friends on the complete opposite end of the spectrum from Blair and Serena, look no further than Jane and Daria from “Daria.” This pair is arguably one of the most cynical, snarky duos ever televised and I will be VERY surprised if you don’t already have most (if not all) of these pieces in your closet somewhere. So let’s get started on a Jane and Daria costume. Daria Morgendorffer‘s outfit is simple: orange t-shirt, black skater skirt, green jacket, black combat boots. Done. The only item you might not have in your closet already are her iconic circular glasses, but these can likely be found at any vintage store or borrowed from any friend who’s obsessed with Harry Potter. 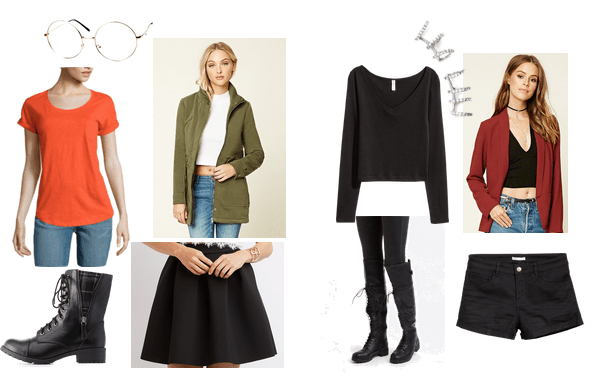 Jane Lane‘s all-black ensemble consists of a sweater (or t-shirt, doesn’t matter as long as it’s a v-neck! ), shorts, and combat boots, all layered under a red blazer. Accessorize with Jane’s edgy silver ear cuff and you’re all set. 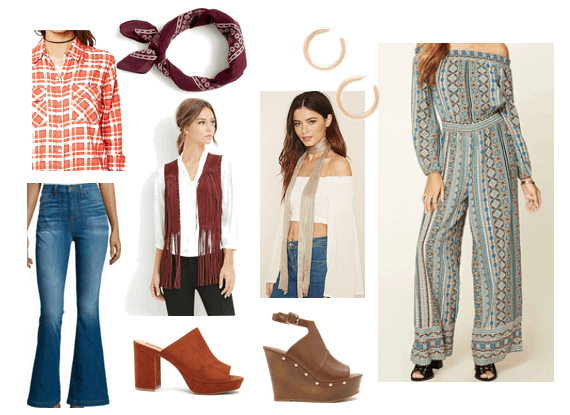 If you and your best friend’s style is a little more boho, try doing a That 70’s Show Jackie and Donna costume! ’70s-inspired fashion has been in for quite some time now, so this look can likely be achieved by wearing whatever you wore to your last music festival. Donna Pinciotti‘s style is a little more tomboyish, and can be achieved with a plaid button-down, bell bottom jeans, a fringed vest, and platform heels, with her signature bandana tying back your hair. Jackie Burkhart is much more girly and fashion-savvy, so rock her look with this daring jumpsuit in a bold print and fierce brown wedges, then accessorize with one of her signature scarves and some stylish hoop earrings. Which TV BFFs costume is your favorite? Will you and your best friend be rocking any of these costumes during the Halloween season this year? Let me know in the comments! Next Quiz: What TV/Movie Fashion Icon Should You Be for Halloween?